THE Jim Duffy era as Dumbarton manager got off to a flying start with a 4-0 win over East Fife at the C & G Systems Stadium on a bitterly cold but sunny afternoon. THE Jim Duffy era as Dumbarton manager got off to a flying start with a 4-0 win over East Fife in front of a 740 crowd at the C & G Systems Stadium on a bitterly cold but sunny afternoon. Sons pushed forward determinedly from the start, and were rewarded on seven minutes when Kyle Hutton drilled the ball wide to Calum Gallagher, who swerved past his man and slotted past 'keeper Bret Long to make it 1-0. The home dominance continued throughout the first half before Bobby Barr doubled the lead going into the break, finishing for 2-0 after unselfish play by Dom Thomas. 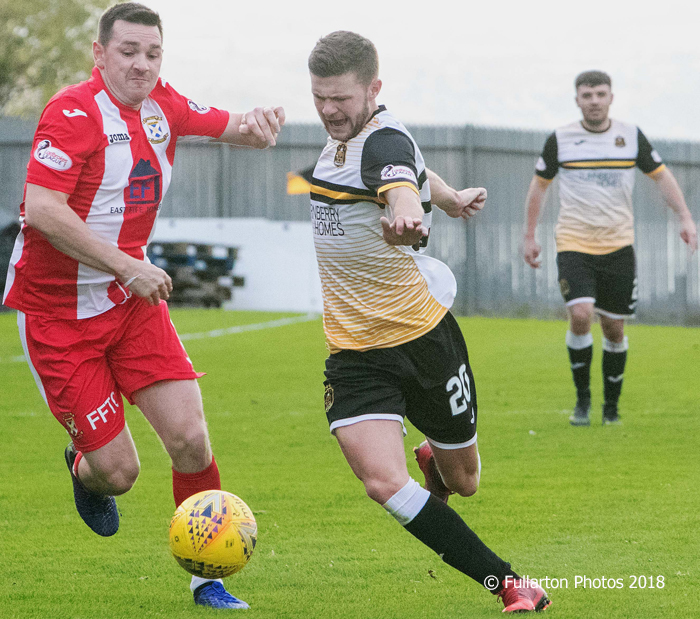 The second half saw East Fife, who won their previous eight matches, fast out of the starting blocks. But it was Dumbarton who struck again on 51 minutes to put themselves three up. A Sons corner was taken quickly and Ross Forbes picked out Stuart Carswell who tapped the ball comfortably home. Dumbarton were then forced into a period of consolidated defence for the first time in the match. They weathered the 17 minute Fife storm solidly. On 68 minutes the visitors went down to ten men. Ross Davidson was booked for a foul, and then red carded after a second yellow for dissent. Sons immediately capitalised when Thomas (pictured) burst through three minutes later and fired a superb low shot past Long to make it a decisive 4-0 win. The victory was sweetened by a deserved clean sheet in addition to the much-needed three points.